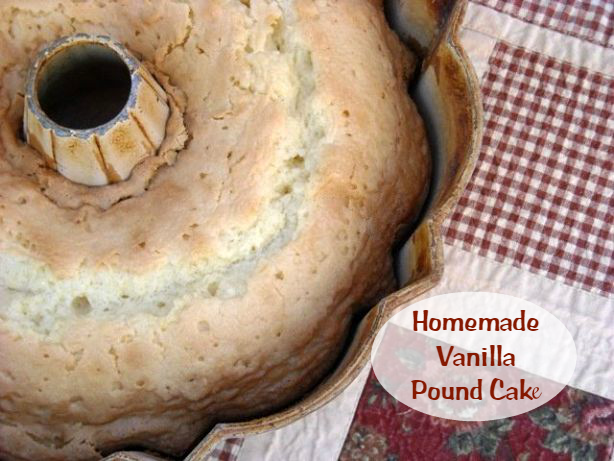 This Homemade Vanilla Pound Cake is a must make!! 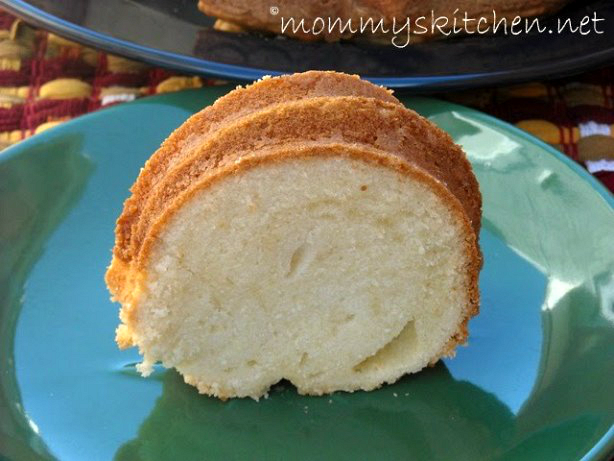 This simple vanilla pound cake comes together quickly and easily and only calls for 6 ingredients. Delicious alone or topped with fresh berries. I'm finally getting around to posting the recipe for the wonderful Homemade Pound Cake I made last week. I added a few teaser photos on face book and then I got really busy, so I apologize for just now getting around to posting it. The first thing I want to say about this pound cake is......... thank goodness it's GONE and out of my house! Talk about temptation, every time I went past that cake I was slicing off a piece. This is so not good for my back side. I guess if I just learned a little will power I wouldn't have a problem, but it was just to darn good. This pound cake by far is the best one I have tasted. Plus it was my first pound cake made from scratch, can you believe that one. I so thought I had passed this hurdle. The making of this pound cake was not planned. It all came to be because I had a quart of whipping cream in my fridge with a very fast approaching expiring date. Hmm what do with all that cream. Well I used some of it to make my favorite Chicken Tetrazzini recipe, but that still left me with some whipping cream. Mama always taught me don't waste food so I had to do something with it. Well I have been wanting to make this pound cake recipe for while now. I saw it at The Hungry Housewife. This recipe is from Leslie's mom, and we all know how recipes from our mothers turn out. Excellent of course.! So I knew this pound cake was going to be great. I want to get off topic a bit and give my girl Leslie a shout out!!!! As a fellow blogger and foodie I just want to say Leslie you rocked on the Home Shopping Network yesterday. Ya did good girl and your dorkiness we all love didn't even show. Heck even if you would of forgot to take out those paper towels from you armpits I bet we would of never noticed. You crack me up and looked so professional. I was beginning to wonder if that lady was gonna let you talk. Goodness someone that talks faster than me. I kept thinking hey let Leslie talk grrrrrr. Don't worry it will get easier the more you do it. I'm happy to say that the Bundt pan I baked this beautiful pound cake in was my 10 year old trusty Nordic Ware Bundt Pan. Do me a favor and tell your mom thank you for this awesome pound cake recipe. Preheat your oven to 325 degrees. Beat butter until creamy, gradually add sugar. Add eggs one at a time, beating well. Add flour and the whipping cream alternately, beginning and ending with flour. Add the vanilla extract last. Pour into a greased and floured Bundt pan or angel food cake pan. drop the pan up an down on the counter to remove any air bubbles and then bake at 325 for 1 hour and 15 minutes. Let cool in pan about 5 minutes then remove and cool completely on a cooling rack. Now don't ya go adding any glaze or anything on this pounds cake. Believe me it is plenty sweet all by itself. This pound cake would be perfect paired with some strawberries. I cant wait till summer. Preheat oven to 325 degrees. Beat butter until creamy, gradually add sugar. Add eggs one at a time, beating well. Add flour and whipping cream alternately, beginning and ending with flour. Add the vanilla extract last. Pour into a greased and floured Bundt pan or angel food cake pan and bake at 325 for 1 hour and 15 minutes. Let cool in pan about 5 minutes then remove and cool completely on a cooling rack. Cook's Note: I strongly recommend using cake flour for this recipe. It really makes the cake. I have not used the substitute for the cake flour in this recipe, so I cannot guarantee the results if you substitute. I've also made a Lightened Up Lemon Pound Cake using this recipe and a Coconut Pound Cake. Ahhh Tina!! You are so very sweet! Thank you so very much for speaking so kindly of me. Some of My dork-ness came out on Todays HSN show.The new video is online...if you go to my blog and click on the link to HSN..the video is right under the photo of the pans. Thanks again!!!! I am also so very glad you liked my Moms pound cake. I dare not to make it right now or I would eat the whole damn thing! Can you believe I've never made or eaten pound cake... and I don't own a bundt pan??? What is WRONG with me!!! Did you know the true pound cake invented decades ago was true to it's name, each ingredient was a pound! Can you imagine, that's how it got it's name! I'll take your recipe over that one and will try it out soon. Thanks! Do you know that I have NEVER made a pound cake?! Go figure! This recipe looks so easy and very tasty... I think it will be the one I try! Thank you for sharing!!!! Tina I'm the same way with my pound cake - and just so you know... it freezes great! If I didn't freeze some when I make it, oh lord it'd be crazy. I'd eat the whole thing!! One of my favorite things is to slice it and toast it too. Yum. My family loves pound cake. I've never made one with whipping cream before, but I bet it IS good. I'm going to try this one. Yes! Thanks for posting this. And your directions make it seem simple enough..I will have to try it soon! Brenda it was easy wasn't it!! I need to get some more cake flour then I will make the coconut. I felt like i was photographing my first born child cause I was so excited when it turned out so good. I just blogged about it, so please take a look at my cake, i think its so pretty...lol...I was excited by easy the recipe was and how good it turned out...Thank you! I LOVE pound cake. This looks amazing!!!!! Where did you purchase your bundt pan? I had one like that a while ago and I really want to purchase another. i would love to make your cake for my sisters birthday tomorrow but i do not own a bundt cake pan. can i use just a regular rectangle or square pan? Hi, pound cakes can also be made in angel food cake pans or a large loaf pan. If using the loaf pan you may need to use two pans. I all depends on the size of the pans. There is quite a bit batter. I made this cake for my daughters baby shower brunch, drizzled with a thin icing and it was a HUGE hit. This is my go-to cake from now on. Thanks for sharing!! For this recipe, what size of bundt pan do u use? Have made this cake literally dozens of times for over thirty years. It has always been a hit at work, home, church etc..mine does call for 3 cups of sugar but am going to try the 2-1/2 cups. It also has a sour cream pecan almost glaze icing but doesn't really need it. Hi! Wonder if i want to use loaf pan instead of using bundt pan, how long I should bake this one? thanks! Can I safely assume you used a preheated oven? A few pound cake recipes out there want a cold oven so wanted to be sure before I tried this one. I noticed this recipe doesn't call for any baking powder, is that correct? No this recipe does not call for baking powder. Jhansi Dasgupta, I have never substituted the whipping cream, so I can't help with that. You can always substitute with Splenda or Truvia Baking Blend. I have had great success using Truvia. I made a lemon pound cake which is linked at the end of this post. hi! Love all your recipes, but sometimes it´s hard for me to find all the ingredients over here in Mexico, I have a question for your Homemade vanilla pound cake, I´ve tried several pound cakes and when I place them in the oven they all colapse, we are at a very high altitude and can imagine that is the problem, might you have some idea that I could do so this doesn´t happen, I would very much appreciate your help. thanks for all your recipes, greetings from Mexico!! My grandmother's receipe that I have always used is 1# butter, 1#eggs, 1# sugar, 1# flour (vanille or almond flavoring)!!!! It is good to see a southern receipe in print, I will have to try it. NOTE: that is where the term pound cake comes from! !